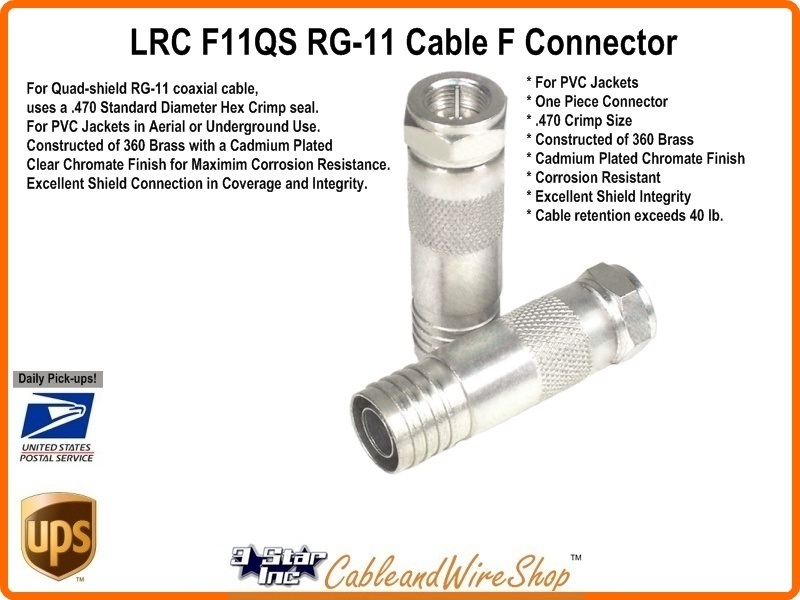 (1 each/unit) For Quad-shield RG11 coaxial cable uses a.470 Standard Diameter Hex Crimp seal. For PVC Jackets in Aerial or Underground Use. Constructed of 360 Brass with a Cadmium Plated Clear Chromate Finish for Maximim Corrosion Resistance. Excellent Shield Connection in Coverage and Integrity. Note: This connector is a modern manufacture of an old design. We started using this design 30 years ago, and we still use it today. Though the Manufacturer rates it for Quad-Shield, we have used them on Tri-Shield and 60% Coaxial Cable as well with no difficulties.